For the first flight, Guido Miletic (right), Head of Marketing & Sales at Dortmund Airport, greeted Kreuza Lubonja (2nd from right), Marketing Director Airport Tirana, as well as the crew on board. 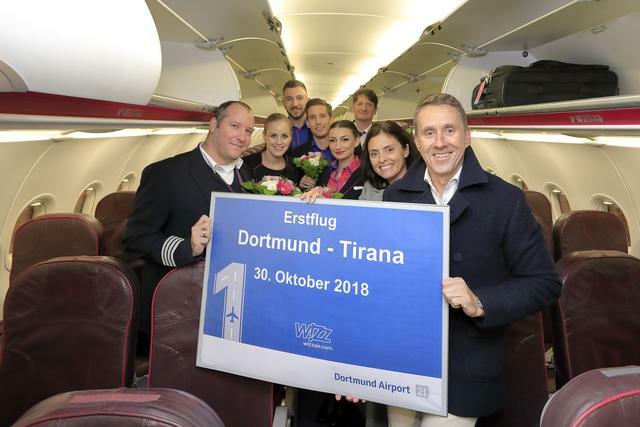 The first flight on the new route from Dortmund to Tirana took off last night. The capital of Albania is the first of five new destinations introduced by the Hungarian airline Wizz Air in the winter timetable. For the first flight, Guido Miletic, Head of Marketing and Sales at Dortmund Airport, welcomed Kreuza Lubonja, Marketing Director Airport Tirana, as well as the crew on board and handed out flowers. Up to three times a week flights to Tirana provide travellers with a direct connection from North Rhine-Westphalia to Albania's capital. The city of about half a million people at the foot of the Dajti Mountains and on the banks of the River Lana, is appreciated by residents and tourists mainly because of the proximity to the coast. During the summer months Tirana is the perfect starting point to spend a beach holiday in one of the coastal towns. Tirana also offers cultural highlights such as the Historical National Museum, the Palace of Culture or the Opera at the central Skanderberg Square.